I know I need to get back on track with posting. I’ve had a rough time of it for various reasons lately. I’m still struggling – some days are better than others, for sure. But at seven months into this adventure, I had been sure things would be different than they are…and that takes some reconciling in my mind and soul. I had several down weekends where I simply didn’t feel like doing anything. But if there is anything for sure in my life, it’s that I don’t like to let myself wallow for too long. Life’s too short for that! 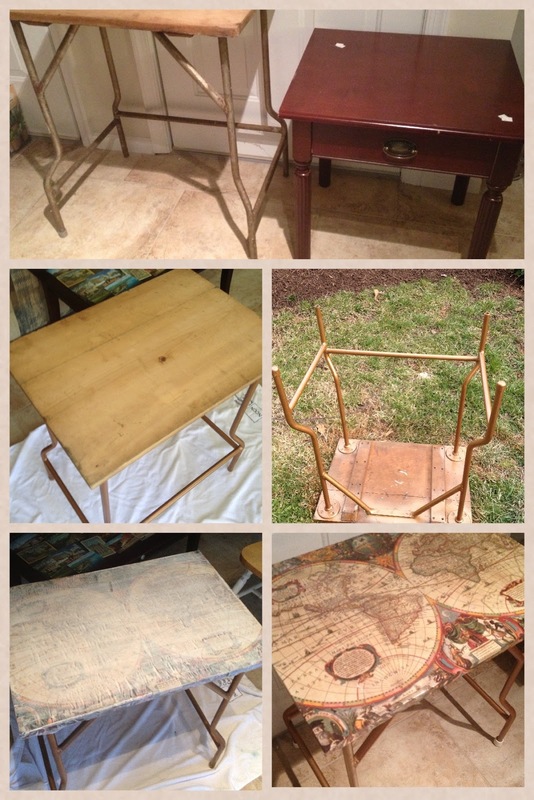 I set my mind on finishing up a table I was refinishing for my living room a couple weekends ago. I’m really pleased with how it turned out. I had originally just stained and polyurethaned it but I was never really happy with it. When I found a cool tutorial on decoupaging with book pages, I knew what my plan was. I posted a note on Facebook, asking my friends to tell me their favorite words and had a great response. I found a dictionary at a thrift store for $2 and was on my way! I painted the shelves red and then tore out my friends’ favorite words from the dictionary, arranged and decoupaged them onto the back area of each shelve. Voila! I am so please with how this one came out. 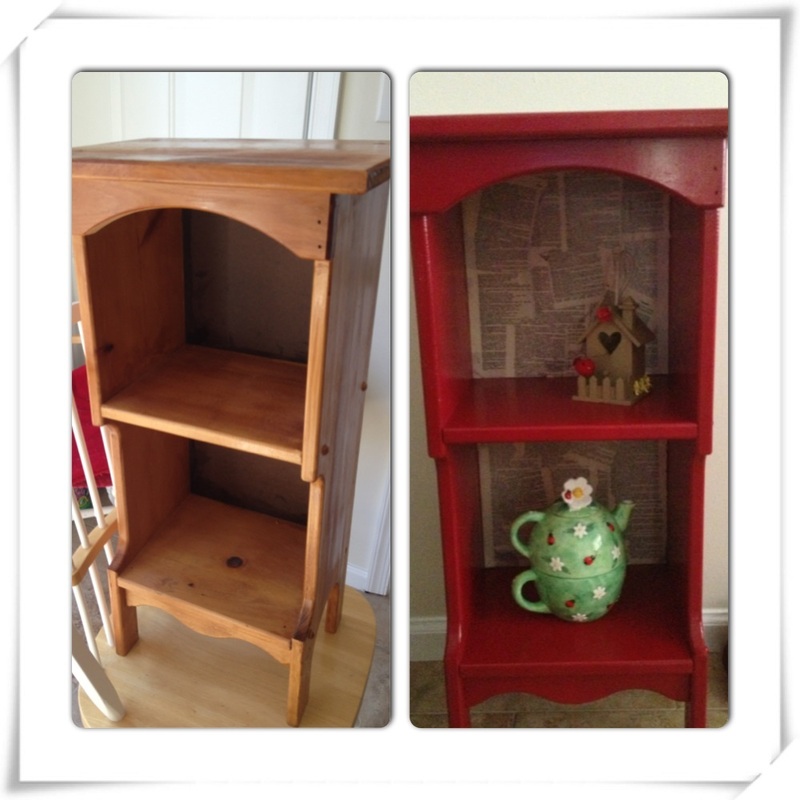 And I’m more than a little hooked on decoupaging – and the idea of decoupaging with book pages. This was a nightstand I bought at a thrift shop back in February. I wasn’t really sure what I wanted to do with it, so it took me a bit of time. It has a retro, shabby chic kind of look about it. 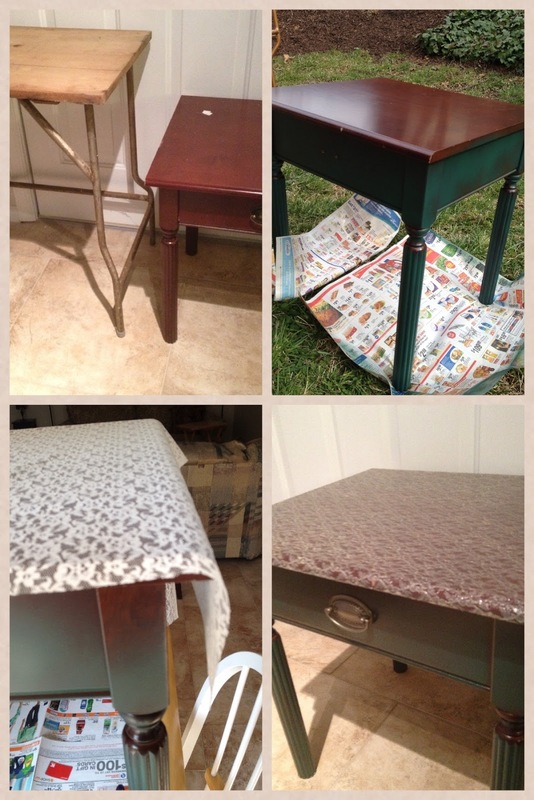 And I learned a lot about decoupaging furniture with fabric…. I’m happy with how they turned out. They are not perfect, by any means, but I’m learning a lot as I work with the different media and I know what I’ll do differently with projects like these in the future. Now the question is what do I do with them? My place is very small and I really have no need for either. I’ve been thinking of setting up an Etsy shop but the easier option may be to simply use Craigslist. We shall see.